1st Land Battel of Civil War reenacted in Philippi, W.V. every June. My family enjoyed a day full of history, music and food at this spring downtown event.The Blue and Gray Reunion brings history to life in the small town of Philippi, West Virgina every 3rd week in June. People crowd the streets to see re-enactors recreate the 1st land battle of the Civil War. Where men dress as Union solders march their way through the city’s trade mark covered bridge to face Confederate solders who fire muskets at the foot of the bridge. The 3 day celebration is packed with history, music, food and crafts. Philippi Covered Bridge build 1876 then burned in the 1980’s then rebuilt. Being the only state created during the civil war, West Virginia’s history is forever linked to that tumultuous time in American History. So when I learned that the first land battle was fought only 25 minutes from my house and they had a festival about the event, that made it impossible for me to miss. Our day started on the beautiful Barbour County Court House lawn only two blocks from the Philippi Cover Bridge were most of the canon and musket fire would happen. We took Christopher out to the grass fields where the solider encampments were set up. He got a first hand look at historically accurate solders accommodations. He asked many questions that the re-enactors answered with responses that were historical correct. The question and answer that surprised even Tom was, “what do you do when not fighting?” The man answered we play rag ball. Christopher and I had no idea what he was talking about and finally he explained that often times soldiers would roll rags into a hard ball and hit it like a baseball with a stick or spend evenings playing cards. We also visited a woman in her tent who had a portable, foot powered, sewing machine and watched as she created a panel for a quilt.She explained that she often made clothes for the solders or did repairs on their tents. We wandered through the vendor tents on the court-house square seeing a black smith, candle maker and other crafts made by local artists. Then in the distance we heard solders marching and calling out orders along the back street behind the Court House. They were getting ready for the battle at the bridge. Tom and Christopher chose to stay on the downtown side of the bridge where the Confederate troops had their camp and were ready to defend the town of Philippi. I crossed the cat walk of the bridge to get some photos of the Union soldiers following them as they marched across the bridge to have a fire fight at the base of the bridge. Canon fire rang out in the valley surrounding the bridge and the smell of sulfur filled the air. I could hardly believe how loud everything was… Compared to a normal day along main street in Philippi. Cannons fired across the Tygert River in downtown Philippi. Union troop members march through the covered bridge to meet Confederate troops on the other side and begin the battle. As the battle moved to the field along the river I was able to talk to a woman who was wearing a beautiful dress along side the battle field. She had made her own dress and crafted her hat. She explained how each person at the event had done research on the clothing and uniforms that they wore. She said that correct portrail of the roles was a key point to the people who did historical reenactments. They loved to learn everything that they could the lives of people that they portrayed. She explained that it was a labor of love and some people would have hundreds of hours of research done before their 1st reenactment. The day before she had been dressed as a morning widow at a memorial service held for those who lost their lives in battle. Dressed in black from head to toe for the funeral services. She and a friend had walked down main street to the local Civil War area church were singing and poetry had been part of the “services”. Lovely hand-made dress at the Blue and Gray Reunion. The kids loved to see the solders reload their muskets and shoot round after round of black powder into the air. When the battle was over many of the men shook hands and walked away as friends to the local gas station for a cool drink. 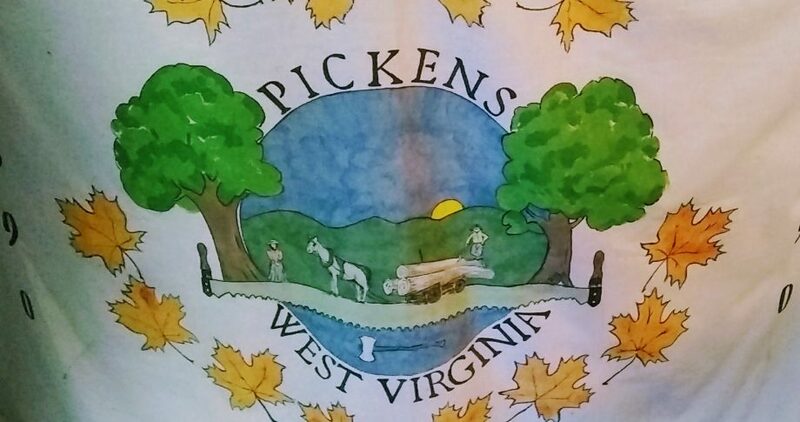 But only in West Virginia have I ever seen three men walk casually into a “Sheets” gas station with large rifles slung over one shoulder and no one seems to mind. The whole town becomes part of the action during these three days. Walking down the street we stop under a tree in the shadow of a house that was used as a hospital during the war. We see an army doctor performing the first Civil War amputation with a dummy. The “Dr.” explains how the procedure was preformed and how to care for the amputation wound after the limb was removed. Christopher was amazed that they could do this kind of thing in a tent on the grass. The only thing I could think of was how lucky we are today to have hospitals and better medications than these young men had back then. We then followed the crowd up the street for some live music and a hot lunch on the court-house steps. Then to our surprise the music stopped and a ring filled the air as someone tolled the iron bell in the county house belfries for those who were “killed”. An emotional reminder of the history of my state and the generations of people who lived and died as part of the Civil War. With our part of the events over we headed home while many more people enjoyed spending time with friends and family at a late afternoon and evening concert. The Blue and Gray reunion was as much fun as education can get for young and old. I only wish that I had planned more time to enjoy the activities that the event offers. The Blue and Grey Reunion organisation website or their Facebook page can help you make plans for next years event or help you learn more about the battle and the history of Philippi and the first land battle of the Civil War. Friends take time a hot afternoon to get a cool drink and visit while sharing their history knowledge.